The Alberta NDP has asked the province's elections commissioner to investigate the United Conservative Party, its leader Jason Kenney, a third-party advertiser called Shaping Alberta's Future and the Motor Dealers' Association of Alberta for wilfully violating the province's elections financing rules. In a letter to Lorne Gibson sent Tuesday, NDP provincial secretary Roari Richardson said the groups worked together to circumvent campaign finance rules. He said the Shaping Alberta Future website states that its political action committee (PAC) is a way to avoid election financing rules, which now prohibit corporate and union donations to political parties. The PAC tells donors it will collect money to help pay for non-political advertising expenses such as overhead. Richardson also said the PAC is working "entirely for the purpose of doing the work of a political party," which is contrary to election financing laws. He then quoted the Shaping Alberta's Future website, which tells potential donors: "One hundred per cent of donor contributions are spent by us on efforts to promote Jason Kenney and the United Conservative Party." The PAC's activities "are not minor or innocent errors being committed in the course of navigating new rules," Richardson wrote in his letter to the election commissioner. "The activities are self-described as a deliberate strategy to avoid the limitations of the elections financing law. "These are severe and wilful violations designed to give the UCP a real financial advantage including large contributions from corporate entities." Richardson said the Shaping Alberta Future website states that its PAC is a way to avoid election financing rules, which now prohibit corporate and union donations to political parties. He quoted a passage on the website to suggest the PAC is offering donors a way to circumvent scrutiny by Elections Alberta. "If you choose this option, there is no requirement to provide your name and information to Elections Alberta," the website said. "Contributions may be spent on, among other things, door-knocking in targeted ridings, opposition research and public opinion research." Transportation Minister Brian Mason said Kenney and Shaping Alberta's Future need to follow the rules. He said Kenney went to the board of the Motor Dealers' Association in September and told them what he could do if his party were to win the election next year. The MDA asked its members to donate $5,000 each with an aim of eventually raising $1 million. Figures posted this week from Elections Alberta show many dealerships came through with cash. "It's pretty clear that this PAC and Mr. Kenney's party, the UCP, are arm and arm," Mason said. The group has been running television ads against the NDP. 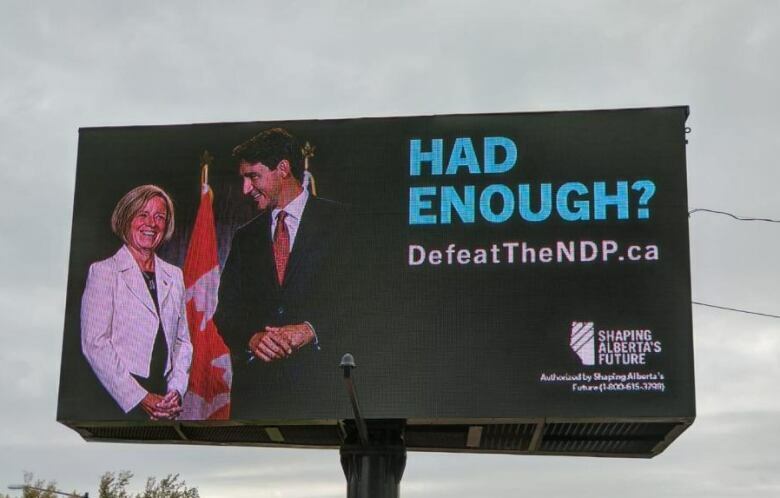 They have also purchased billboards with the question "Had enough?" imposed beside a photo of Premier Rachel Notley and Prime Minister Justin Trudeau. 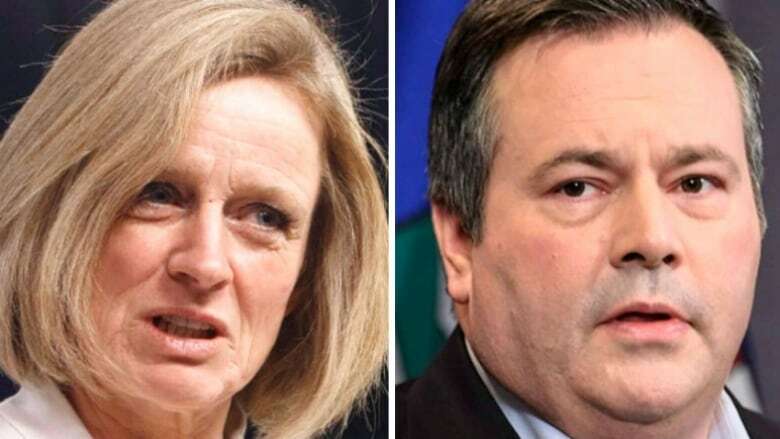 UCP spokesperson Christine Myatt said asking for policy proposals doesn't not mean Kenney will act on them. She says the MDA's statement that Kenney promised to repeal all changes to the labour code, employment standards and the Workers Compensation Board is not true. "The UCP and its leader are fully complying with the laws that the NDP itself implemented," she wrote in an email. "Perhaps the NDP needs to familiarize itself with its own law. It's also interesting that the NDP seemingly has no problem with their special interest PAC friends amassing a war-chest of nearly $750,000 — paid for with mandatory union dues." Dennis Ducharme, president of the MDA, denies Kenney made any promises in return for cash. He said the UCP Leader asked the organization to survey its members on what legislative changes they would like to see. "We're being painted with a broad brush right now," the former Progressive Conservative MLA said. "There was no such deal made. He's going to look into it with his transition team...this is the government that our dealers felt that they should be supporting." Ducharme said the money donated to Shaping Alberta's Future would counter the third-party advertising in support of the NDP. "(The NDP) took away all the rights for industry to be able to provide dollars to election campaigns," he said. "The only way industry can do it is through the third-party advertising. No different from what the unions are doing. "What's fair for one should be fair for the other. And we just wanted to be able to make sure that the UCP had the dollars necessary to counter the negative ads that will be forthcoming." The pro-Kenney third-party advertiser Shaping Alberta's Future received $375,000 in donations between July 1 and Sept. 30, 2018. So far in 2018, the Alberta Federation of Labour's political action committee has received $251,248 in donations. Project Alberta, another pro-NDP PAC, has accumulated $385,000 in donations this year. Richardson's letter to the elections commissioner came one day after a letter written by Andrew Robinson, chairman of the Motor Dealers' Association, was reported in the media. The letter from Robinson said Kenney had met with the association that represents motor vehicle dealers and made promises that included rollbacks to consumer protections introduced by the NDP government. "MDA president will be asked to meet with the UCP transition team to provide input on how to re-balance the playing field between consumers and industry," Robinson wrote. "Returning [Alberta Motor Vehicle Industry Council] to a delegated authority from a government agency, appointments of AMVIC chair, compensation fund control, etc." The letter said Kenney told the association about new funding caps outlined in election finance rules that limit political party donations to $4,000 per donor each year. Third-party advertisers, including political action committees, can accept donations from unions and corporations. Starting on Dec. 1, the groups can spend up to $150,000 until the election writ is issued next year. PACs will be allowed to spend another $150,000 during the campaign period but not more than $3,000 to target any candidate in a particular constituency. "The challenge is the UCP war chest at this time prevents them from countering the negative ads against the UCP from various provincial unions, other groups received funding from left-leaning socialist agencies and/or funds from the NDP party campaigning against the right," Robinson's letter said. "Without adequate funding, the UCP cannot counter these allegations and when there is no rebuttal — one loses the media messaging battle." Mason said the car dealers aren't happy with legislation the NDP brought in to more closely regulate their industry. "We passed a car buyers bill of rights and they want Jason Kenney to undo it," Mason said. "Their correspondence indicates they have an understanding with Mr. Kenney that they're going to do that." He said one of the changes made by the NDP banned false and misleading advertising by car dealers.